Chicco Next 2 Me Magic Crib makes nights with your little one extra easy. Suitable from birth to 9kg, this convenient bedside crib allows your child to be closer to you throughout the night, whilst they are sleeping. Why should I choose the Chicco Next 2 Me Magic Crib? The Chicco Next 2 Me Magic Crib is a perfect co sleeping crib for your little munchkin. The luxury design of this baby bed offers maximum comfort for both parent and baby. Featuring a roll-up sliding panel which can be manoeuvred with one hand, you can easily reach your little one whilst it's fixed to your bed. This is extra handy for when you need to calm baby during the night! To do so, simply push the button and the panel with automatically roll down at the bottom of the crib. Easy for when your sleeping has been disturbed! If you want to comfort your little monster even more, this bedside crib features a rocking mode. This can be comfortably activated from buttons which are located on the top of the cribs frame. 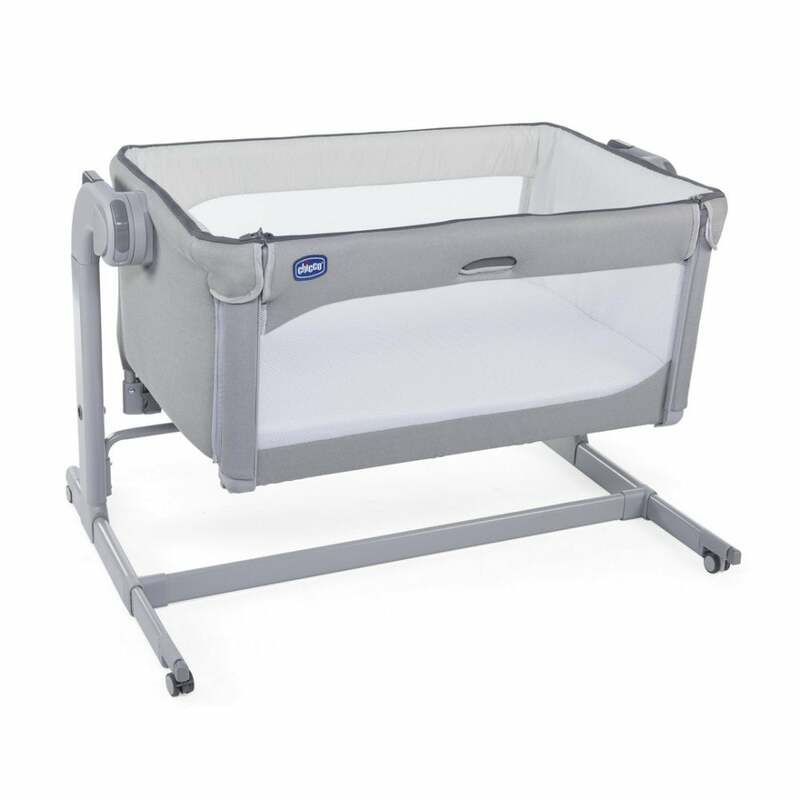 To ensure ultimate comfort for baby, the Next 2 Me Magic Crib includes double mesh windows and a 3D mesh mattress cover which ensures an excellent air flow. Fantastically, this bedside crib by Chicco can be adjusted to 11 different height levels, which means that it will fit any kind of bed - whether you're sleeping on a put-up bed in the nursery or not! What's more, it has retractable feet, so that its perfect for beds with drawers. Looking for a bedside crib that will add a touch of style to your room? The Chicco Next 2 Me Magic Crib features premium fabrics that have been specifically designed for each colour. This helps to meet everyone's taste. If you need to move it from one side of the bed to the other, then fear not. The Next 2 Me Magic Crib by Chicco features 4 swivelling wheels with brakes, meaning it can be moved around your room, the nursery, or the house in general, effortlessly. Additionally, the Next 2 Me Magic Crib by Chicco can be tilted up to 4 levels. This can help your little one's digestion or to help with noise congestion. So, if you feel that co sleeping should be made easier, then the Chicco Next 2 Me Magic Crib is perfect! This product is suitable for a child who is not able to sit alone, turn and raise themselves by pushing on hands and knees. Please read enclosed instruction booklet. If parent's bed is not compatible with the crib's fastening system, use the product as a traditional crib (with all sides closed). Chicco offer a 2 year Manufacturers Warranty on products from the initial date of purchase. Applies to UK and Ireland only.